The Payment Card Industry Data Security Standard (PCI DSS) is a set of requirements designed to ensure that companies that store, process or transmit credit card information maintain a secure environment. Forum Sentry can provide the framework and infrastructure to enable PCI compliant transactions across a wide diversity of message formats and protocols. 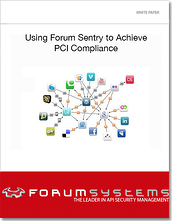 Download our whitepaper Using Forum Sentry to Achieve PCI Compliance. Read about how each of the PCI DSS Goals can be accomplished by deploying Forum Sentry Gateway Technology.